The Black Academy of Arts and Letters (TBAAL) is a multi-discipline arts organization whose mission is to create and enhance an awareness and understanding of artistic, cultural and aesthetic differences utilizing the framework of African, African-American and Caribbean Arts and Letters. Additionally, its purpose is to promote, foster, cultivate, perpetuate and preserve the Arts and Letters of Africans, African-Americans and Caribbean in the Fine, Literary and Performing Arts. On July 17, 1977, Curtis King founded TBAAL on his dining room table with a personal investment of $250. TBAAL was grown from the New York City based, Black Academy of Arts and Letters in 1969. Now based in Dallas, Texas, TBAAL is housed in a 250,000 sq. ft. facility (located in the heart of downtown in the Dallas Convention Center). 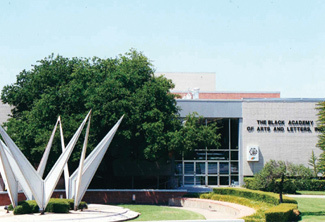 TBAAL is the only arts institution and African-American organization housed in a major urban convention center in the nation. You can read more about TBAAL’s history, its purpose and its objectives here. TBAAL has 2 theatres (Naomi Bruton Main Stage – seats 1800 and Clarence Muse Café Theatre – seats 250), a costume shop, 5 large banquet/meeting rooms, gallery, gift shop, administrative offices, etc. Annually, TBAAL presents and produces over 100 programs, in theatre, music, dance, literary arts, film and visual arts. In November 2009, TBAAL presented HIP HOP BROADWAY-THE MUSICAL, a piece written by Curtis King, at Dallas’ new AT&T Performing Arts Center in the Winspear Opera House. The production starred Grammy Award Winner Erykah Badu, Tony Award Winners Jennifer Holliday and Melba Moore, Metropolitan Opera Star Harolyn Blackwell and Tony Award Winner Nominee Felicia P. Fields. To date, this performance has the highest attendance of any program offered during the AT&T Performing Arts Center inaugural season. TBAAL is currently in its 37th Season which began September 2013 and runs through August 2014. Some notable celebrities who will perform/appear this season are Grammy and Pulitzer Prize Winner Wynton Marsalis, Rhonda Ross, The Honorable Cynthia McKinney, Peabo Bryson, Kim Coles, Debbi Morgan, Rashaan Patterson, Maysa, Loretta Devine, Sarah Dash and Kim Jordan. To view or search TBAAL’s calendar by month, click on this link. Also check out TBAAL’s YouTube page for more info. TBAAL is housed in the Dallas Convention Center which can be reached on the Red and Blue lines.